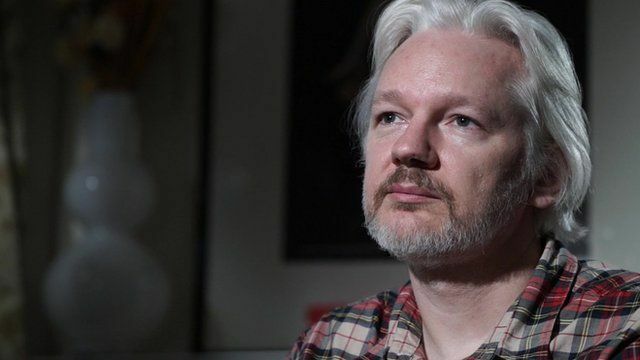 Assange on his 'difficult situation' Jump to media player The BBC's John Simpson speaks to Wikileaks founder Julian Assange on his new book and his continued refuge at the Ecuadorian Embassy. Assange 'to leave embassy soon' Jump to media player Wikileaks founder Julian Assange has suggested he will leave the Ecuadorean embassy in London "soon". 'Governments seek god-like knowledge' Jump to media player WikiLeaks founder Julian Assange speaks on the subject of knowledge, and its relationship with power. Wikileaks founder Julian Assange has spoken out about his continued self-imprisonment at the Ecuadorian Embassy in London. Mr Assange sought refuge at the embassy in June 2012 to avoid extradition to Sweden to face questioning over alleged sexual offences. He said it was a "difficult situation for a national security reporter" but "in some ways there are benefits". The BBC's John Simpson talked to Mr Assange about his new book on Google, which he claims working alongside the US government.